These adorable strawberry flavored “Queen of Hearts” Homemade Strawberry Pop Tarts are perfect for Valentine’s Day or an Alice in Wonderland kids birthday party! 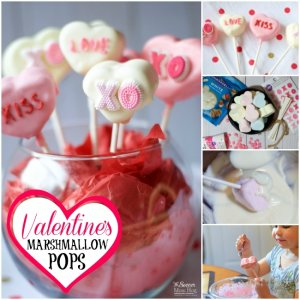 Looking for something different than the “usual” Valentine’s Day treats? 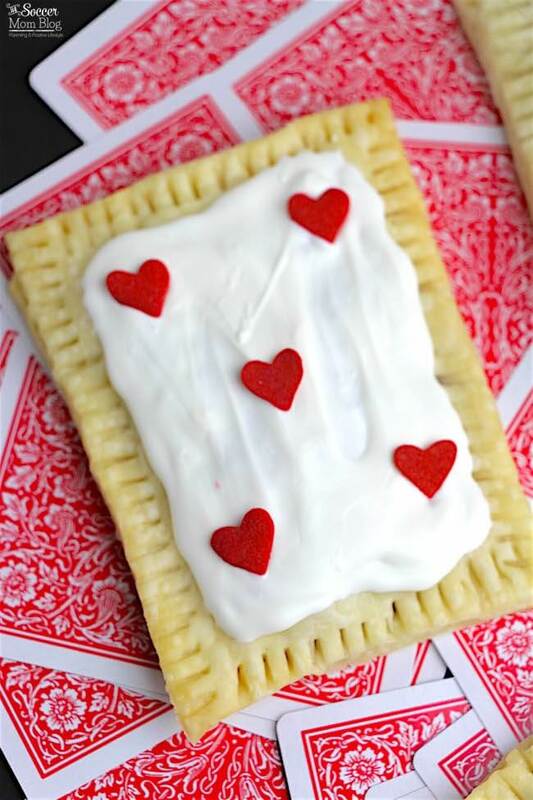 These Queen of Hearts pop tarts are just the thing! My daughter and I created these Queen of Hearts pastries for a recent Valentine’s Day get-together. 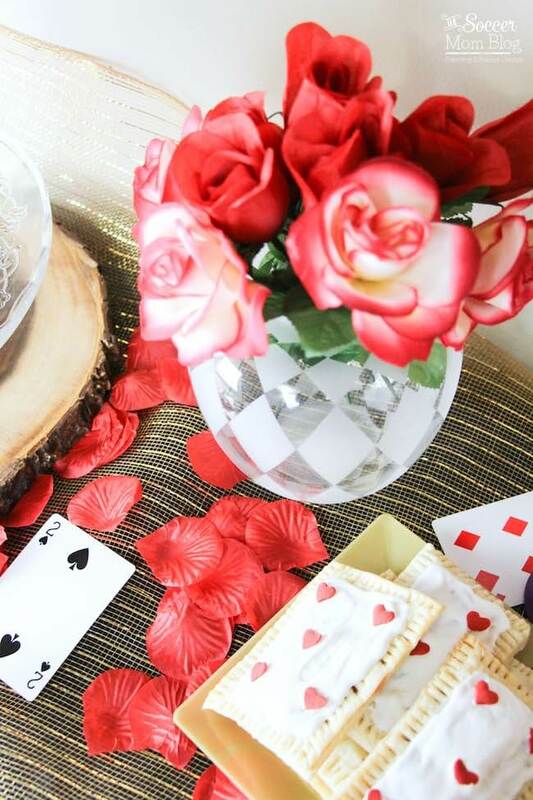 Our inspiration: the scene in Alice in Wonderland with the playing card soldiers and the Queen of Hearts. These homemade strawberry pop tarts take less than an hour between pulling out the ingredients and setting them on your party tables cape. So much easier than expected! My daughter helped me make this batch — so this is absolutely a recipe you can make with kids! They’ll love to bake ’em almost as much as they’ll love to eat them! Recipe by Jennifer at Sugar Spice & Glitter for the Soccer Mom Blog. Related: Next up, we make Stained Glass Heart Cookies! Keep reading for photo step-by-step instructions or click here to jump to printable recipe copy. NOTE: Short on time? Opt for frozen butter puff pastry or pie pastry for a quick version! Mix the flour, salt, sugar, butter and 6 Tablespoons shortening together with a fork or your hands. Add the water in increments until a smooth dough results. Roll the dough out to 1/4″ thickness and cut into 4×6″ rectangles. 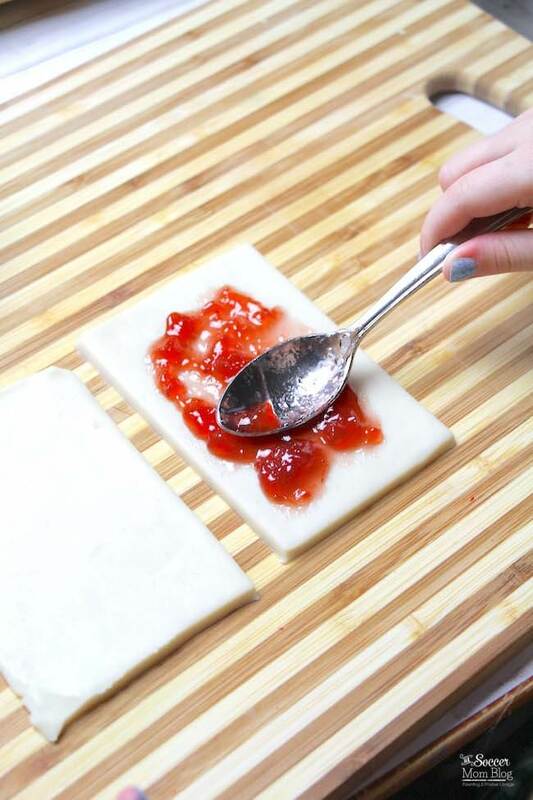 Spread strawberry jam onto a rectangle of dough, avoiding the edges by 1/2″. 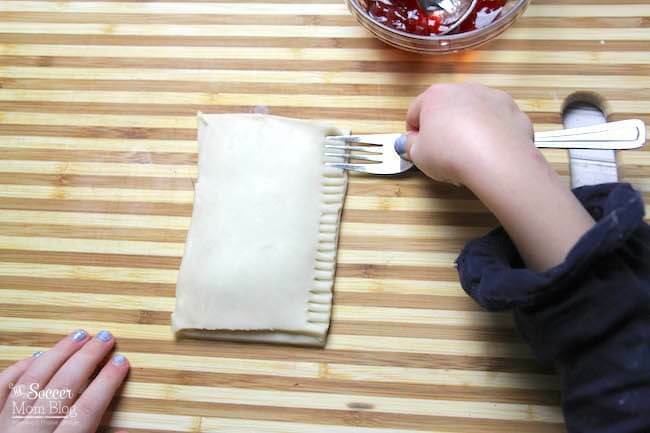 Place another rectangle overtop and press the edges together with your fingers or a fork. Place the pop tarts onto a lined baking sheet and bake for 12-15 minutes until golden brown. Allow the pop tarts to cool completely before frosting. Combine the candy melts and 1 TB shortening together in a small bowl and microwave in 30-second increments, stirring well in between each heating, until smooth. Spread the candy melts onto the pop tarts and add the hearts in a card pattern while the candy melts are still wet. Allow the candy melts to dry completely before storing or serving. Grab a free printable copy of this homemade pop tarts recipe at the bottom of the post! Heart sprinkles (or playing card sugar decorations available here) helps make the decorating so much easier. Save this base recipe to make any form of poptart you’d like! Maybe you want rainbow pop tarts or have other fun sprinkles to bring a new theme to the mix. Swap out the fillings with your favorites! 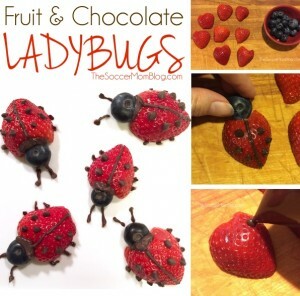 Maybe instead of strawberry jam you’d prefer Nutella? OR dulce de leche? Whatever your flavor, these cute homemade pop tarts will be a hit with your crew! 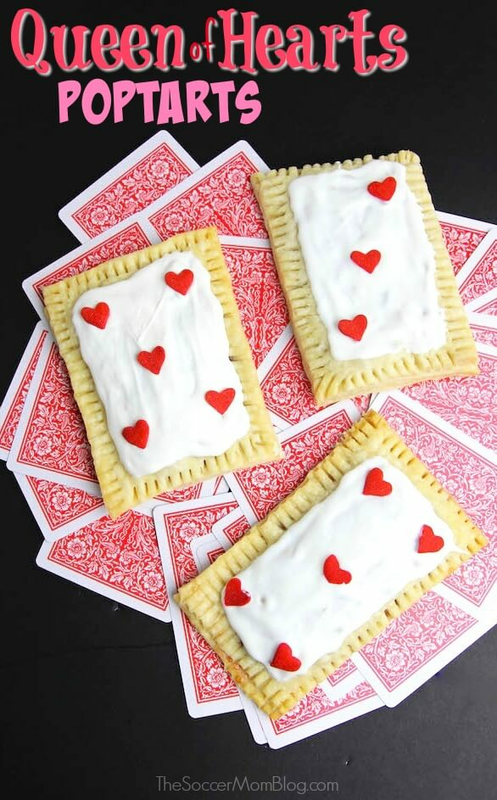 These playing card pop tarts are perfect for a grown-up casino themed party or poker night! Do you have a special occasion coming up that these homemade strawberry pop tarts would be perfect for? 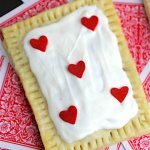 These adorable strawberry flavored "Queen of Hearts" Homemade Pop Tarts are perfect for Valentine's Day or an Alice in Wonderland kids birthday party! Roll the dough out to 1/4" thickness and cut into 4x6" rectangles. Spread strawberry jam onto a rectangle of dough, avoiding the edges by 1/2". Place another rectangle overtop and press the edges together with your fingers or a fork. Allow the candy melts to dry completely before storing or serving. Makes 4-6 pastries.